← How risky are TIPS mutual funds and ETFs? 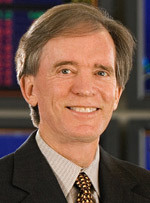 Bill Gross, founder and managing director and of the PIMCO investment firm, is known for laying it all out in his opinion pieces on the PIMCO site. And his March 2012 treatise doesn’t disappoint. Although many investors seem to dislike Gross (example from Forbes: Bill Gross’s Bad Call Cost Investors $5.7 Trillion! ), I am a fan. He was wrongly negative about Treasuries last year, but I agreed with him at the time, so I was wrong too. We both were using too much common sense. Yields certainly cannot go lower? Oops, yes they can, in a world where the Federal Reserve is manipulating the market, forcing interest rates down. It’s called ‘financial repression’ and it might be the overriding force pushing up the price of stocks, gold, oil, gasoline. Gross recognizes this. Over the past 30 years, an offensively minded Federal Reserve and their global counterparts were printing money, lowering yields and bringing forward a false sense of monetary wealth. Successful investing in a deleveraging, low interest rate environment will require defensive in addition to offensive skills. The PIMCO defensive strategy playbook: Recognize zero bound limits and systemic debt risk in global financial markets. Accept financial repression but avoid its impact when and where possible. Emphasize income we believe to be relatively reliable/safe; seek consistent alpha. Low yields, instead of fostering capital gains for investors via the magic of present value discounting and lower credit spreads, begin to reduce household incomes, lower corporate profit margins and wreak havoc on historical business models connected to banking, money market funds and the pension industry. The offensively oriented investment world that we have grown so used to over the past three decades is being stonewalled by a zero bound goal line stand. Investment defense is coming of age. And it’s not just households who are hurt. 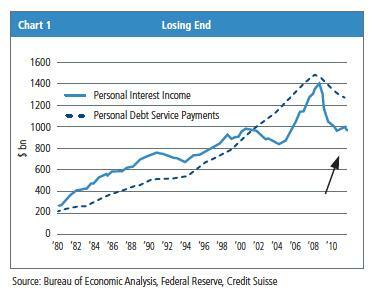 Gross points out that near-zero interest rates are ravaging the business models of insurance companies and banks. Gross continues his silly football metaphors with a ‘Ready, Set, Hut 1, Hut 2’ offensive strategy that pretty much recommends a PIMCO fund. Oh, well. And what is that? He doesn’t say. Just read the article yourself. My interest in all this is that Gross is joining Charles Schwab in criticizing the Fed’s destructive policy of driving down interest rates, from 30 days to 30 years. I agree that these artificially low interest rates, well below the current rate of inflation, are dangerous and destructive. Honestly, these rates make no sense. Why do investors accept them? Answer: The Fed has guaranteed that this policy will continue well into 2014.